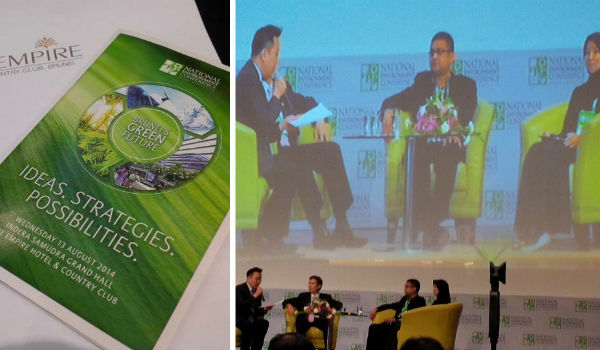 As a panelist at National Environment Conference 2014 representing The GreenAsia Group, Vinod Kesava, Executive Director/COO, delivered a message for Brunei’s Green Future. Together with Mr Edwin Khew from Sustainable Energy Association of Singapore (SEAS), Ms Yanty Rahma from PUJA and Mr Stuart Lee, the moderator, from Rhymin & Partners, Vinod addressed how to create Bandar Seri Begawan as a model of ‘Eco-Smart’ City”, looking at best practices, policies and technologies. Vinod advised a “holistic approach” for the creation of an ‘eco-city’ and said that the country can’t expect to find a “single solution” as the challenges for such projects often cover a large scope. He mentioned that the concept of an ‘eco city’ in Brunei Darussalam has to be led by the government which holds the key to consolidating different viewpoints on environmental issues as the market becomes increasingly specialised.